This topic contains 3 replies, has 3 voices, and was last updated by Neha Vansh 1 year ago. 4.I need to integrate site in 2 languages. I am using WPML.When I copied page to other language, it shows widgets only on 1 page ,not on the both lang pages. (1,2). Yesterday, we have released the 4.3.11 version of MDW in which we have disabled Page Builder in the Customizer. Mostly because of WordPress API change which caused a lot of issues with this feature. This is why for now it is not available at all. It will come back with the next minor update. 3. I can’t reproduce your error. Make sure that any of your plugins didn’t cause this issue. 4.1. I can’t reproduce your error. Make sure that any of your plugins didn’t cause this issue. Also, it can be caused by our page builder which is deprecated. (4.2,5) We support Loco translate, you can find all information on https://mdwp.io/wordpress-tutorial-loco-translate/. when will the new version available. I would like to buy the pro version, but at the moment most of the feature are not working properly. I am trying to upgrade to latest version.When I click on download button,it downloads & shows message “You have the latest version of MDW. Enjoy!”. But when I refresh the page, it again gives me the same message. 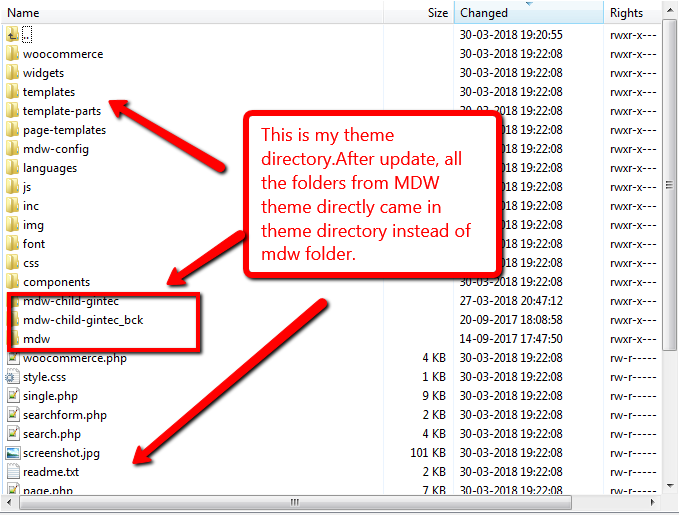 Also when I checked in my folder structure, I found that directly in the theme folder, all mdw files are appearing instead of mdw folder.